In order to enter Cambodia, you will need a visa. When you book your holiday with Dragon Travel, we will send you an information pack including visa application forms and instructions for application. Airport taxes are now included in ticket prices for both domestic and international departures, and you should not have to pay anything at the airport. The currency in Cambodia is called the 'Riel' (KHR). At the time of writing £1 = 6690 KHR approx. US$1 = 3985 KHR approx. There is no point in trying to obtain Riel in the UK, it is best to buy what you need on arrival. We recommend that you change only a small amount into Riel, just enough to cover your immediate needs. The US dollar is also universally accepted, as is the Thai Baht. In summary, we recommend you carry US dollar bills and a credit card for settling hotel incidentals bills and major purchases. If your mobile phone is enabled for roaming, you will find it works in the main towns and cities of Cambodia but may not work in more remote areas. Electricity supply is 220VAC, 50Hz. Power sockets are generally Euro style 2-pin. We strongly recommend you take medical advice from your doctor before visiting any part of Indochina. He or she will be be able to advise you on the latest health-related recommendations and preventive measures. Water is drinkable in major hotels, but we recommend you stick to bottled water which is available everywhere. In particular, when ordering beer or other drinks, ensure that any ice offered is safe to drink. The parts of Cambodia that we visit are very safe destinations and visitors rarely experience crime or other difficulties, but please remember that there are bad people everywhere and petty crime can be a problem. Please take sensible precautions as for any 'third-world' country. Please do not carry passports, important papers or a lot of money when walking in the street: make use of hotel safes where available. Handbags and cameras are tempting targets for thieves, as is ostentatious jewellery or watches. 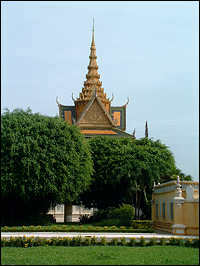 Cambodia lies in the tropical zone and is suitable to visit all the year round. The weather is hot all year but the months between November and March are a little cooler. From late May to late October in the monsoon season and rains can be expected, however it is not often that a whole day is ruined by rain: the tropical pattern is for short rainstorms, especially in the afternoon & evening. The sandstone monuments at Angkor are particularly beautiful after a rainstorm. In April and May, water levels in rivers and lakes may be low. Best time to visit: November to March is best, but all year round is fine.